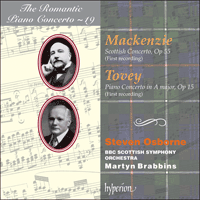 Two first recordings of concertos by a Scot (Mackenzie) who settled in England as Principal of the Royal Academy of Music and an Englishman (Tovey) who settled in Scotland as a Professor at Edinburgh University's Reid School of Music. Mackenzie's Scottish Concerto, premiered by no less a man than Paderewski in 1897, is a colourful and entertaining work which uses several Scottish themes in a fundamentally Lisztian design. As befits the academic and scholarly Tovey, his concerto of 1903 is in a much more serious and Brahmsian vein, indeed the first movement in particular sounds uncannily like Brahms from beginning to end. The work is characterized by great rhythmic energy and superb, rich orchestration. Not just another piano concerto, but a major and unaccountably neglected symphonic work. Please note the carefully chosen Mackenzie tartan featured as part of the cover design! Both composers share a Scottish connection: Mackenzie was Scottish in name, accent, blood and culture; Tovey became Scottish by adoption, chiefly because he occupied Edinburgh’s Reid Chair of Music with great distinction for the last twenty-six years of his life. Mackenzie occupied a parallel role as Principal of the Royal Academy of Music in London (from 1888 to 1924), and although he had none of the academic pretensions of Tovey (who graduated with distinction from Oxford), Mackenzie was a fine linguist and had a mind of great sophistication and wit. He could count amongst his honorary degrees music doctorates from St Andrews, Edinburgh, Cambridge, McGill and Oxford Universities. Mackenzie was knighted in 1895, Tovey in 1935 (the year of Mackenzie’s death) and both men have suffered subsequently from being associated with the Establishment, though both were, in their own ways, quite radical. They gained little from their own exalted status and their music suffered the same neglect at home as that of other British composers; British publishing houses were not prepared to support British works, least of all piano concertos. By the way, your (and existing copies in England) copy may well become very valuable! I see that the Germans are melting down all music plates for bullets: and as these are in Leipzig, no doubt by this time the concerto has been re-cast in another form, less musical, but more effective perhaps. You see how this ghastly business touches us all in many queer forms. Although composed within six years of each other, the two concertos are superficially strongly contrasted. The Mackenzie is openly virtuosic, its Scottish bravura balanced by sentiment and wit. The Tovey is no less technically demanding and is unconcerned with display, though its rhetoric has both grandeur and vivacity. But in both works there is a sense of unity of purpose in which the early romantic battle between first and second subjects, often characterized respectively as masculine and feminine, is no longer a driving force, and in which the pitting of soloist against orchestra, individual against society, has no place whatever. The intellectual strengths in these two outstanding works are not revealed through argument, but through cooperation. In the case of the Mackenzie, the cooperation of masculine and feminine is fundamental. Such mild liberties as may have been taken with the established canons of Harmony and Composition not infrequently called forth sarcasms referring to ‘Young Germany and Young Scotland’. But these occasional ‘scraps’ did not disturb the pleasant relationship between master and pupil, and a stricter discipline was of rare benefit to me. Tovey’s education was a different matter altogether. Under the benign and intelligent direction of his patroness, Miss Weisse, he was initially trained as a virtuoso pianist and composer. As precocious as Mackenzie, at the age of twelve on a journey to Wales he lost his luggage, his hat and his return ticket; but not the twenty-four miniature scores with which he has padded his jacket ‘for reading in the train’. Despite small hands, Tovey reached a high level of accomplishment, and premiered his own concerto. He was born in Eton, graduated in classical honours from the Scottish-founded Balliol College, Oxford, and died in Edinburgh, where his memory is still green. Tovey was noted for his irreverent wit on matters musical—providing famous fugues and sensitive slow movements with ridiculous lyrics so apt that they cannot be quoted as they are capable of destroying for ever one’s finer feelings for works of genius. More seriously, he contributed to the art of writing programme notes with great distinction, publishing some of them under the title Essays in Musical Analysis. Perhaps he was inspired by his predecessor in the Edinburgh Reid Chair of Music, John Thomson (1805–1841), who is reliably credited with having introduced programme notes to the world. Tovey’s editions of Bach and Beethoven are still in use today and, quirky though some of them may be, his comments are always stimulating and intelligent. As a composer he has been neglected. Tovey’s only other concerto is the massive Opus 40 Cello Concerto which he composed for Pablo Casals, who premiered it in Edinburgh on 22 November 1934. It is probably the longest cello concerto ever composed, but its power and vivacity have kept it alive despite such an obvious obstacle. Besides these, there is a Symphony (1913), the opera The Bride of Dionysus (1907–1918) and a number of fine chamber pieces, notably the Elegiac Variations and the Sonata Eroica, both for cello and piano. My concerto went very well: Wood [Sir Henry] proved a really wonderful interpreter & there wasn’t a single point in which he didn’t anticipate my most detailed and least obvious intentions, besides getting all the swing and balance of the whole. Stanford has been amazingly kind & has twice made the Royal College orchestra play it with me. Thus Tovey, writing to Edward Speyer in November 1903. But despite this auspicious start and subsequent performances, including one under Fritz Busch in Aachen in 1913 and others in Edinburgh, the concerto only re-emerges from obscurity with this CD—and it is a revelation: Tovey is not a composer ignored because of his idiosyncracies, but because of his unaffected mastery. Brahms will immediately be invoked—and rightly. After all, this work was composed only three years after Brahms’s death, and composed by a young man still in his twenties. But it is no less lovely for being thoroughly Brahmsian, and the material is Tovey’s and it is handled with the consummate skill that can only be born from an inspiration that belongs to that composer and that composer alone. Mere derivation could not produce such a seamless, coherent and yet compelling work, and the concerto is a true and worthy child of its parent. I always remember your first performance, and I remember you wore a dress of a very pretty, soft blue which seemed exactly to suit the music. Soft blue is scarcely the colour of the opening statement from the piano, threatening portentous matters. But A major is not a portentous key, and the breadth of this simple scale-and-arpeggio opening evokes an immediate response from the woodwind of staccato quavers which prefigure the celebratory nature of the movement. This terse contrast is essentially classical: there is no big romantic theme, rather there is a balanced conception which demands and receives expansion. A part of the ascending scale appears in heroic, exuberant and rich pastoral guises in quick succession; and suddenly we have reached the second subject in D major—warm and lyrical. The piano enters with its opening material reworked and this double exposition leads to a more dramatic treatment in the development; and at all times the piano and orchestra are working together, leading up to the joyous recapitulation, the brilliant writing for the horns redolent of peals of bells. Here the power of the opening idea is asserted and the celebratory mood given final affirmation. The F sharp minor Adagio opens with a dialogue of simple but expressive feeling, but the latent intensity is evoked by an echo of the opening of the first movement, and solo oboe and strings explore the loneliness as well as the sense of sharing that are so often at the heart of our deepest intimacies. Nothing is over- or understated in this beautifully scored movement, mature beyond its composer’s years. The Alla marcia final movement starts light-footed, but soon picks up a young man’s stride, and a splendid fugato (one of the few such that sounds spontaneous) is perfectly integrated into the half-marching, half-dancing and utterly irresistible progress of Tovey’s musical troops. Ever and always the piano and orchestra travel together, and this absolute unity of purpose is one of the work’s great strengths. It is without bravado, yet it asserts magnificently an integrated self-confident vitality, in which individual and society are as at home with one another as this neglected work will surely be with its audiences. As to the ‘Scottish’, I don’t know any particular reason why they don’t do it more frequently—except that, generally, British pieces are never in favour. The Scottish Concerto is Scottish in every possible way. It is based on three well-known and old Scottish traditional melodies; it embodies and comments upon their character, both emotional and technical, and it draws its dramatic development from the lyrics associated with the tunes. It is declared to be Scottish, was composed by a Scot and, on this CD, is performed by a Scottish soloist and orchestra. But it is far from the romantic image of a Scotland of weeping glens and desolate moorlands, for this is a work of great wit, sentiment and panache, though however overt and open-handed it may seem, it has its own happy secrets. The piano concerto in the nineteenth century became a quintessentially romantic form—employing the heroic genius and virtuosity of the individual’s assertions in the midst of the vast crowd of the orchestra, and this at a time when liberalism and nationalism were overturning the old regimes of Europe. But there is nothing jingoistic about the Scottish Concerto, and its moments of self-aggrandizement are often tongue-in-cheek. Apart from anything else, there is no sense of aggression or combat between soloist and orchestra; like the Tovey, but in a totally different manner, it is one of the most obviously cooperative of piano concertos and (once one understands its subject matter) it is easy to see why this must be so, for the work is a celebration of the masculine and feminine and their coming together—at one and the same time it contrives to be rhetorical and sprightly, and to create a pastoral idyll with the potential of a grand amour. You have, throughout your happily long life, been a consistent supporter of all that is best. You have never bowed the knee to Baal. Scot you are, and canny you may be, as your birth-land proverbially expects. But your canniness has always been exercised to benefit others rather than yourself, and therefore I prefer to call it a wise humanity. This was a ‘wise humanity’ which was nonetheless capable of double entendre and self-assertion. Alternative racier words to favourite Scottish songs were regularly referred to by the editors of the nineteenth century who, far from being prudes, let their readers know of the existence of bawdy texts, many of which were, and remain, genuinely unpublishable for a public which might want to teach the songs to their children. Mackenzie knew all this better than most and, as we shall see, he also had deep personal experience of the need for self-assertion. The concerto opens with a splendid dignity derived from The Reel of Tulloch, one of the oldest bagpipe reels but one which is associated with the outlawed MacGregors, one of whom ran off with Iseabail Dhubh Thulach (with her passionate consent), an event followed by brutal family reprisals from which the couple escaped. Being a pipe tune, a piper is implied, and Mackenzie incorporates many of the stylistic elements that the Highland bagpipes have given to Scottish music. But after a dramatically assertive entry by the piano, it turns out that the main Allegretto is an irrepressibly skittish piece of writing which alternates and combines easily with an expansive, even grandiose theme, so that the music seems almost to dance upon its own self-importance. Its masculine self-assertion is indeed to be taken seriously—but never for too long! In this it reflects brilliantly the complex resonances of a story in which true love mocks the jealousy of its enemies. Though the pipes in The Reel of Tulloch are Highland ones and the shepherd’s pipe is a gentler instrument, the two are related—and it was not only in Burns’s The Merry Muses that the chanter pipe was a sexual metaphor. But just as Ramsay has softened the metaphor, so too Mackenzie has gentled the tune. Nonetheless, it is surely no accident that the melody is given to the cellos, for the cello has a woman’s shape. Ardent, and yet deeply nostalgic, the modal simplicity of the tune is asserted in the complex key of C sharp minor, and the innocence of the sentiment is expanded into an expression of love in which breadth and grandeur are now the unquestioned prerogative of all lovers. Mackenzie alternates this with delicate dialogues between piano, woodwind and horns, until the hazy drum-beat of summer heralds the return of the cellos. The movement ends with the oboe evoking the pastoral pipes, and the piano deciding the equivocal modality of the tune in favour of a blissful, contented E major. The Finale is a wonderfully witty and knowing interpretation of Green Grow the Rashes O which, even in its mildest version, is one of the most happily suggestive of love songs: as Burns put it, ‘The sweetest hours that e’re I spent were spent amang the lassies O!’. This old tune makes its first appearance in the Straloch Manuscript of 1627–9 where it is titled Grein Greus ye Rasses—A Daunce, and this movement is certainly a dance of triumph and delight. It starts with a reference to The Reel of Tulloch from the first movement, itself a triumphant dance; and there is no lack of mutual self-assertion, for upon their victory over her own family, Iseabail shouted ‘Give me a glass of your beer, love, and we shall dance the Tulaichean!’, but Green Grow the Rashes O is the theme which dominates—a theme of union rather than defiance. Of all the romantic composers who have used Scottish traditional melodies, Mackenzie is the only one to have done so with such a sophisticated yet unforced sympathy and musical understanding. The orchestra sets the scene, and the piano races to join them, itself fooling with the reel and the rushes, with a combination of pianistic and orchestral panache—the piano with block parallel chords, the piccolo cheeky and delighted as ever. An ’twere na for the lasses, O? An’ then she made the lasses, O.
Mackenzie et Tovey partagent un même lienÿavec l’Ecosse: le premier était écossais de nom, d’accent, de sang et de culture; le second le devint par adoption, essentiellement parce qu’il occupa la Reid Chair of Music d’Edimbourg avec force distinction durant les vingt-six dernières années de sa vie. Mackenzie occupa une charge analogue en tant que directeur de la Royal Academy of Music de Londres (de 1888 à 1924); bien que n’ayant aucune des prétentions universitaires de Tovey (diplômé d’Oxford avec mention), il fut un bon linguiste, à l’esprit très raffiné et vif, et put compter parmi ses grades honoris causa des doctorats en musique des universités de St Andrews, Edimbourg, Cambridge, McGill et Oxford. Mackenzie fut fait chevalier en 1895, Tovey en 1935 (l’année de la mort de Mackenzie) et tous deux souffrirent par la suite de leur association avec l’establishment, même si chacun fut, à sa manière, un parfait radical. Ils retirèrent peu de leurs positions élevées et leur musique pâtit du même manque d’égards en Grande-Bretagne que celle des autres compositeurs britanniques; les maisons d’édition britanniques n’étaient pas prêtes à soutenir les œuvres britanniques, encore moins les concertos pour piano. A propos, il se pourrait fort bien que votre copie (et toutes celles qui existent en Angleterre) deviennent des plus précieuses! Je constate que les Allemands sont en train de fondre toutes les planches de musique pour en faire des balles: et comme ces planches se trouvent à Leipzig, nul doute que le concerto a déjà été refondu sous une autre forme, moins musicale, mais plus efficace peut-être. Vous voyez comment cette atroce affaire nous affecte tous de bien des façons bizarres. Quoique composés à six années d’intervalles, les deux concertos sont superficiellement fort contrastés. Celui de Mackenzie, ouvertement virtuose, voit sa bravoure écossaise équilibrée par le sentiment et l’intelligence. Celui de Tovey, techniquement aussi exigeant, ne se soucie pas de démonstration, même si sa rhétorique recèle grandiose et vivacité. Les deux œuvres présentent toutefois une unité de dessein, où l’ancien conflit romantique entre premier et second sujets—souvent qualifiés respectivement de masculin et de féminin—n’est plus une force motrice, et où l’opposition soliste/orchestre, individu/société n’a plus aucune place, d’aucune sorte. Dans ces deux œuvres remarquables, les forces intellectuelles sont révélées via la coopération, non la dispute. Chez Mackenzie, la coopération du masculin et du féminin est fondamentale. De légères libertés comme celles qui ont pu être prise avec les canons établis de l’Harmonie et de la Composition suscitèrent de fréquents sarcasmes se référant aux «Young Germany and Young Scotland». Mais ces «bagarres» occasionnelles ne dérangèrent pas l’agréable relation de maître à élève et une discipline plus stricte me fut d’un bénéfice rare. Avril 1930: Mon cher Mackenzie, Je vais rarement à Londres, maintenant que j’ai—pour le dernier tour de piste—pris ma retraite dans ma vieille ville. Là, en 1881, «nous» (!) donnâmes The Bride, vous à la composition, moi au violon: je passe souvent devant la vieille salle où cette interprétation eut lieu, et je pense à ces grands jours, à ma fierté et à mon ravissement de vous avoir été présenté par Geo: d’Egville. Et combien cette œuvre était (et est) charmante, et combien vous nous surprîtes et dominâtes tous, et combien nous fûmes (et sommes) fiers de vous—et personne plus que votre vieil ami. L’éducation de Tovey fut radicalement différente. Sous la douce et intelligente direction de son mécène, Miss Weisse, il reçut d’abord une formation de pianiste virtuose et de compositeur. Aussi précoce que Mackenzie, il n’avait que douze ans lorsqu’il entreprit un voyage au Pays de Galles et perdit ses bagages, son chapeau et son billet de retour, mais pas les vingt-quatre partitions de poche dont il avait matelassé sa veste, «pour lire dans le train». Malgré ses petites mains, il atteignit à un haut niveau et donna la première de son propre concerto. Né à Eton, il obtint une licence de lettres classiques au Balliol College d’Oxford, de fondation écossaise, et mourut à Edimbourg, où son souvenir demeure vivace. Réputé pour son irrévérence en matière musicale, Tovey dota des fugues célèbres et des mouvements lents sensibles de paroles ridicules impossibles à citer, tant elles pourraient détruire à jamais les sentiments élevés de chacun envers les œuvres de génie. Plus sérieusement, il contribua à la rédaction de notes de programme (dont certaines furent publiées sous le titre Essays in Musical Analysis) avec grande distinction, peut-être inspiré en cela par son prédécesseur à la Reid Chair of Music, John Thomson (1805–1841), auquel on attribue, de source sûre, l’invention de ce genre. Les éditions de Bach et de Beethoven établies par Tovey sont encore utilisées de nos jours et, pour bizarres qu’ils puissent parfois être, ses commentaires sont toujours stimulants et intelligents. Compositeur négligé, il n’écrivit qu’un seul autre concerto, le massif Concerto pour violoncelle, op.40, destiné à Pablo Casals, qui en donna la première à Edimbourg, le 22 novembre 1934. Il s’agit probablement du plus long concerto pour violoncelle jamais conçu—mais, nonobstant cet obstacle évident, sa puissance et sa vivacité l’ont maintenu en vie. Tovey écrivit en outre une Symphony (1913), l’opéra The Bride of Dionysus (1907–1918), et un certain nombre de belles pièces de chambre, notamment les Elegiac Variations et la Sonata Eroica, toutes deux pour violoncelle et piano. Mon concerto marcha très bien: Wood [Sir Henry] se révéla un interprète vraiment merveilleux et il n’y eut pas un seul endroit où il n’anticipât mes intentions les plus infimes, les moins évidentes, en plus d’apporter tout le rythme et l’équilibre de l’ensemble. Stanford s’est montré incroyablement gentil et l’a fait jouer deux fois par l’orchestre du Royal College, avec moi. Mais malgré ce bon départ, et des interprétations ultérieures (dont une sous la direction de Fritz Busch, à Aix-la-Chapelle, en 1913, et d’autres à Edimbourg), ce concerto ne ressort de l’ombre qu’avec le présent CD. Et c’est une révélation: Tovey est un compositeur ignoré en raison non de son idiomatisme, mais de sa maîtrise sans affectation. Brahms sera immédiatement invoqué, et à juste titre. Après tout, cette œuvre ne fut composée que trois ans après sa mort, et par un jeune homme d’une vingtaine d’années. Mais ce caractère profondément brahmsien ne lui ôte en rien son charme; le matériau est de Tovey, et il est manié avec un talent consommé qui n’a pu naître que d’une inspiration appartenant à ce compositeur et à lui seul. Un simple dérivé n’aurait pu engendrer pareille œuvre homogène, cohérente et pourtant envoûtante, vraie et digne enfant de son pére. Je me rappelle toujours de votre première, et je me rappelle que vous portiez une robe d’un très beau bleu pastel, qui semblait parfaitement convenir à la musique. Le bleu pastel n’est guère la couleur de l’énonciation initiale au piano, menaçante et de mauvais augure. Mais la majeur n’est pas une tonalité de mauvais augure, et le jeu large de cette ouverture en gammes et en arpèges suscite une réponse immédiate des bois, dont les croches staccato préfigurent la nature festive du mouvement. Ce contraste abrupt est fondamentalement classique: ici, point de grand thème romantique, mais une conception équilibrée, qui exige et reçoit un développement. Une partie de la gamme ascendante apparaît sous de riches dehors héroïques, exubérants et pastoraux, qui se succèdent rapidement; et soudain, nous avons atteint le second sujet en ré majeur—chaud et lyrique. Le piano entre alors avec son matériau initial reformulé, cette double exposition conduisant à un traitement plus dramatique dans le développement; à chaque fois, le piano et l’orchestre travaillent ensemble, pour mener à la joyeuse reprise, dont la brillante écriture pour les corps évoque des sonneries de cloches. La puissance de l’idée initiale est confirmée et l’atmosphère festive reçoit une ultime affirmation. L’Adagio en fa dièse mineur s’ouvre sur un dialogue simple mais expressif; l’intensité latente est cependant suggérée par un écho du début du premier mouvement, tandis que le hautbois solo et les cordes explorent la solitude et le sens du partage si souvent au cœur de nos relations intimes les plus profondes. Rien n’est exagéré, ni amoindri dans ce mouvement merveilleusement instrumenté, mature par-delà les ans de son compositeur. Le mouvement final Alla marcia a d’abord le pied léger, puis prend un rythme de jeune homme, et un splendide fugato (un des rares qui semblent spontanés) est parfaitement intégré à la progression partie marche, partie danse, complètement irrésistible des troupes musicales de Tovey. Encore et toujours, le piano et l’orchestre voyagent ensemble et cette absolue unité de dessein est l’une des grandes forces de l’œuvre. Sans bravade, elle affirme pourtant magnifiquement une vitalité intégrée, pleine d’assurance, où l’individu et la société se sentent à l’aise l’un avec l’autre, comme ce sera sûrement le cas entre cette œuvre oubliée et ses auditeurs. Quant au «Scottish», je ne connais pas de raison particulière au fait qu’on ne le joue pas plus souvent—excepté que les pièces britanniques ne sont, en général, pas à la mode. Le Scottish Concerto est écossais de toutes les manières possibles. Il repose sur trois célèbres mélodies traditionnelles écossaises anciennes, dont il incarne et amplifie le carcatère émotionnel et technique, tirant son développement dramatique des paroles qui leur sont associées. Il est ouvertement écossais, fut composé par un Ecossais et est interprété sur ce CD par un soliste et un orchestre écossais. Mais nous sommes loin de l’image romantique d’une Ecosse de vallons suintants et de landes désolées, car cette œuvre recèle force esprit, sentiment et panache, même si, pour évidente et généreuse qu’elle puisse paraître, elle possède ses propres secrets heureux. Au XIXe siècle, le concerto pour piano devint une forme quintessentiellement romantique—recourant au génie héroïque et à la virtuosité des assertions de l’individu au cœur de la vaste foule de l’orchestre, et ce à une époque où libéralisme et nationalisme renversaient les vieux régimes d’Europe. Mais il n’y a rien de cocardier dans le Scottish Concerto et les moments où il veut se pousser en avant sont souvent ironiques. Quoi qu’il en soit, il n’y a ni agression, ni combat entre le soliste et l’orchestre; comme chez Tovey, mais d’une manière radicalement différente, nous retrouvons l’évidente coopération des concertos pour piano et il est aisé (dès lors qu’on en comprend le sujet) de voir pourquoi il doit en être ainsi, cette œuvre étant une célébration du masculin et du féminin, de leur union—qui trouve le moyen d’être à la fois rhétorique et alerte, de créer une idylle pastorale au potentiel de grand amour. Vous avez été, au cours de votre vie heureusement longue, un constant soutien de tout ce qui se fait de mieux. Vous ne vous êtes jamais agenouillé devant Baal. Vous êtes écossais et pouvez vous montrer prudent, comme il sied proverbialement à votre terre natale. Mais votre prudence s’est toujours exercer au profit des autres plus que de vous-même, aussi je préfère la dire sage humanité. Une «sage humanité» qui n’en est pas moins capable de sous-entendus et d’affirmation de soi. Les éditeurs du XIXe siècle, loin d’être prudes, faisaient régulièrement référence à des paroles plus osées des grandes mélodies écossaises, permettant à leurs lecteurs de découvrir l’existence de textes paillards, dont la plupart étaient, et demeurent, franchement impubliables pour un public qui pourrait souhaiter apprendre ces mélodies à ses enfants. Mackenzie savait tout cela mieux que quiconque et eut également, comme nous le verrons, une profonde expérience du besoin d’affirmation de soi. Le concerto s’ouvre avec une splendide dignité tirée de The Reel of Tulloch, l’un des plus anciens reels pour cornemuse, associé aux MacGregor hors-la-loi, dont un membre s’enfuit avec Iseabail Dhubh Thulach (avec son consentement passionné), acte suivi de brutales représailles familiales dont le couple réchappa. Qui dit mélodie pour cornemuse dit cornemuseur, et Mackenzie incorpore nombre des éléments stylistiques que les cornemuses de haute Ecosse ont donné à la musique écossaise. Après une entrée dramatiquement péremptoire au piano, l’Allegretto principal se révèle une pièce irrépressiblement frivole, qui alterne et se combine aisément avec un thème expansif, voire grandiose, de sorte que la musique semble presque danser sur sa propre suffisance. Son affirmation de soi masculine est à prendre au sérieux—mais jamais pour très longtemps! Elle reflète brillamment les résonances complexes d’une histoire dans laquelle l’amour vrai se moque de la jalousie de ses ennemis. Même si la cornemuse de The Reel of Tulloch est de haute Ecosse et que celle du berger est un instrument plus doux, toutes deux sont liées—et le chalumeau de la cornemuse n’était pas une métaphore sexuelle dans les seules The Merry Muses de Burns. Mais Mackenzie a adouci la mélodie, comme Ramsay a adouci la métaphore. La mélodie n’est toutefois pas confiée par hasard aux violoncelles, instruments à la forme féminine. Ardente et pourtant profondément nostalgique, la simplicité modale de cette mélodie est affirmée dans la complexe tonalité d’ut dièse mineur, tandis que l’innocence du sentiment est développée en une expression d’amour, où ampleur et grandiose sont désormais les prérogatives incontestées de tous les amoureux. Mackenzie la fait alterner avec de délicats dialogues entre le piano, les bois et les cors, jusqu’à ce que le brumeux battement de tambour de l’été annonce le retour des violoncelles. Le mouvement s’achève avec le hautbois, qui évoque la cornemuse pastorale, et le piano, qui détermine la modalité équivoque de la mélodie en faveur d’un bienheureux et satisfait mi majeur. Le Finale est une interprétation merveilleusement spirituelle et entendue de Green Grow the Rashes O qui, même dans sa version la plus édulcorée, est l’une des chansons d’amour les plus volontiers suggestives: pour reprendre Burns, «Les heures les plus douces que j’eusse jamais passées furent parmi les jeunes filles O!». Cette vieille mélodie apparaît pour la première fois dans le Straloch Manuscript de 1627–9, sous le titre Grein Greus ye Rasses—A Daunce, et ce mouvement est certainement une danse de triomphe et de ravissement. Il débute par une référence à The Reel of Tulloch du premier mouvement, qui est lui-même une danse triomphante; il y a là une affirmation de soi mutuelle car, à leur victoire sur sa propre famille, Iseabail s’écria «Donne-moi un verre de ta bière, mon amour, et nous danserons le Tulaichean!», mais Green Grow the Rashes O est le thème dominant—un thème d’union plus que de défi. De tous les compositeurs romantiques ayant utilisé des mélodies écossaises traditionnelles, Mackenzie est le seul à l’avoir fait avec une telle affinité sophistiquée, mais aisée, une telle compréhension musicale. N’étaient les jeunes filles, O? Et puis elle créa les jeunes filles, O.
Beide komponisten haben eine Beziehung zu Schottland: Mackenzie war Schotte durch seinen Namen, den Dialekt, den er sprach, seine Abstammung und Kultur; Tovey wurde durch „Adoption“ zum Schotten, und zwar in erster Linie deswegen, weil er während der letzten sechsundzwanzig Jahre seines Lebens den durch die Reid-Stiftung finanzierten Lehrstuhl für Musik an der Universität Edinburgh mit großem Ruhm innehatte. Mackenzie spielte eine parallele Rolle als Direktor der Royal Academy of Music in London (1888–1924), und obgleich er keine akademischen Ambitionen wie Tovey hatte (der sein Studium an der Universität Oxford mit Auszeichnung abschloß), war Mackenzie sprachbegabt, besaß einen ausgeprägten Intellekt und gesunden Menschenverstand. Zu den ihm verliehenen Ehrenwürden zählen Musikdoktorate von den Universitäten St. Andrews, Edinburgh, Cambridge, McGill und Oxford. Mackenzie wurde 1895 zum Ritter geschlagen und Tovey 1935 (Mackenzies Sterbejahr). In Folge dieser Ehrung litten beide Männer darunter, daß man sie mit dem Establishment assoziierte, obgleich sie beide auf ihre eigene Art und Weise ziemlich radikal waren. Beide profitierten nur wenig von ihrer erhabenen Stellung, und im Inland wurde ihre Musik im gleichen Maße vernachlässigt wie die anderer britischer Komponisten. Britische Verleger waren nicht bereit, britische Werke zu unterstützen—am allerwenigsten Klavierkonzerte. À propos, Dein Exemplar (und alle in England existierenden) können durchaus noch wertvoll werden! Ich stelle fest, daß die Deutschen alle Notendruckplatten einschmelzen, um Kugeln daraus zu gießen: und da sie in Leipzig sind, ist das Konzert inzwischen ohne Zweifel in eine andere Form gegossen wurden, nicht so musikalisch, aber vielleicht wirksamer. Du siehst, wie uns diese entsetzliche Angelegenheit auf vielerlei unterschiedliche Art und Weise berührt. Obwohl die beiden Konzerte im Abstand von nur sechs Jahren komponiert wurden, weisen sie an der Oberfläche starke Kontraste auf. Mackenzies ist ganz offen virtuosenhaft, und Gefühl und Geist bilden ein Gegengewicht zu seiner schottischen Bravour. Toveys ist technisch nicht weniger anspruchsvoll und legt keinen Wert auf Zurschaustellung, obgleich seine Rhetorik sowohl Erhabenheit als auch Lebhaftigkeit besitzt. In beiden Werken finden wir jedoch das Gefühl einer einheitlichen Absicht, bei dem der anfängliche romantische Kampf zwischen dem ersten und zweiten Thema, die häufig als männlich bzw. weiblich charakterisiert werden, nicht mehr länger die Antriebskraft ist, und wo der Kampf des Solisten gegen das Orchester, des Einzelnen gegen die Gesellschaft, überhaupt keinen Platz hat. Die intellektuellen Stärken dieser beiden herausragenden Werke werden nicht durch Argumentieren, sondern durch Kooperation an den Tag gebracht. Bei Mackenzies Konzert ist die Kooperation zwischen männlich und weiblich von fundamentaler Bedeutung. Die schüchternen Freiheiten, die man sich bei den eingeführten Regeln der Harmonie und Komposition erlaubt haben mochte, riefen Sarkasmus über „Jung Deutschland und Jung Schottland“ hervor. Doch diese gelegentlichen „Kabbeleien“ trübten das angenehme Verhältnis zwischen Lehrer und Schüler nicht, und die strengere Disziplin war mir von seltenem Nutzen. Toveys Bildung sah ganz anders aus. Unter der gütigen und intelligenten Weisung seiner Patronin Fräulein Weisse wurde er zuerst als virtuoser Pianist und Komponist ausgebildet. Ebenso frühreif wie Mackenzie, verlor er im Alter von zwölf Jahren auf einer Reise nach Wales sein Gepäck, seinen Hut, seine Rückfahrkarte, jedoch nicht die vierundzwanzig Miniaturpartituren, die er „zur Lektüre im Zug“ in seine Jacke gesteckt hatte. Obwohl er kleine Hände hatte, erreichte er einen hohen Grad der Vollkommenheit und übernahm die Uraufführung seines Konzertes selbst. Geboren war er in Eton, sein klassisches Studium absolvierte er am Balliol College in Oxford, das von einem Schotten gegründet worden war, mit Auszeichnung und starb in Edinburgh, wo die Erinnerung an ihn noch frisch ist. Tovey war für seinen respektlosen Witz in musikalischen Angelegenheiten bekannt—er schenkte uns berühmte Fugen und einfühlsame langsame Sätze mit lächerlichen Texten, die so treffend waren, daß man sie nicht zitieren kann. Sie sind nämlich in der Lage, einem die feineren Gefühle für geniale Werke für immer zu verderben. Einen ernsteren und ausgezeichneten Beitrag leistete er zur Kunst des Verfassens von Programmerläuterungen, von denen er einige unter dem Titel Essays in Musical Analysis veröffentlichte. Vielleicht war er hierzu von seinem Vorgänger am Lehrstuhl für Musik an der Universität Edinburgh inspiriert, John Thomson (1805–1841), der der Welt nachweislich zum ersten Mal Programmerläuterungen brachte. Toveys Ausgaben von Bach und Beethoven sind noch heute in Gebrauch, und obgleich einige seiner Kommentare vielleicht etwas kurios sind, sind sie dennoch immer anregend und intelligent. Als Komponist ist er vernachlässigt worden. Toveys einziges anderes Konzert ist das riesige Cello-Konzert Opus 40, das er für Pablo Casals schrieb, der es am 22.11.1934 in Edinburgh uraufführte. Es ist vermutlich das längste Cello-Konzert, das jemals komponiert wurde, doch seine Kraft und Lebendigkeit haben es trotz dieses offensichtlichen Hindernisses am Leben erhalten. Außer diesen gibt es noch eine Symphonie (1913), die Oper The Bride of Dionysus (1907–1918) und eine Reihe ausgezeichneter Kammerstücke, ganz besonders Elegiac Variations und die Sonata Eroica, beide für Cello und Klavier. Mein Konzert lief sehr gut: Wood [Sir Henry] erwies sich als wirklich wunderbarer Interpret, und es gab keine einzige Stelle, an der er nicht meine detailliertesten und am wenigsten offensichtlichen Absichten antizipierte, abgesehen davon, daß er den Schwung und das Gleichgewicht des ganzen begriff. Stanford ist überraschend gütig gewesen und ließ das Orchester des Royal College zweimal mit mir spielen. Dies schrieb Tovey im November 1903 an Edward Speyer. Doch trotz dieses Anfangs unter günstigen Auspizien und nachfolgenden Aufführungen, darunter auch eine unter der Leitung von Fritz Busch 1913 in Aachen und anderen in Edinburgh, taucht das Konzert erst wieder mit dieser CD aus der Verborgenheit auf—und dies ist eine überraschende Entdeckung: Tovey ist nicht ein Komponist, der wegen seiner Exzentrizitäten ignoriert wurde, sondern wegen seiner nicht affektierten Meisterhaftigkeit. Man denkt da sofort an Brahms—und zu Recht. Schließlich wurde dieses Werk nur drei Jahre nach Brahms’ Tod komponiert, und zwar von einem jungen Mann, der noch keine dreißig war. Doch die Tatsache, daß es durch und durch Brahms ist, macht es nicht weniger liebenswert. Und das Material stammt von Tovey, der es mit einem vollendeten Können behandelte, das nur einer Inspiration entspringen kann, die dem Komponisten und nur ihm alleine gehört. Eine reine Ableitung könnte kein so nahtloses, kohärentes und dennoch fesselndes Werk hervorbringen, und das Konzert ist ein wahres und würdiges Kind seines Schöpfers. Ich erinnere mich immer an Deine erste Aufführung, und ich erinnere mich, daß Du ein Kleid in eine sehr hübschen, lieblichen Blau trugst, das genau zur Musik zu passen schien. Ein liebliches Blau ist kaum die Farbe für die anfängliche Themenaufstellung des Klaviers—bedrohliche, Unheil verkündende Dinge. Doch A-Dur ist keine unheilvolle Tonart, und die Breite dieses einfachen Tonleiter-und-Arpeggio-Anfangs ruft eine sofortige Antwort von den Holzbläsern mit einem Achtelnoten-Staccato hervor, die die Feierstimmung des Satzes vorab bildlich darstellt. Dieser knappe Kontrast ist im wesentlichen klassisch: kein großes romantisches Thema, sondern eine ausgewogene Konzeption, die Erweiterung fordert und erhält. Ein Teil der aufsteigenden Tonleiter erscheint in heroischen, überschwenglichen und vollen pastoralen Gestalten in schneller Abfolge; und plötzlich sind wir beim zweiten Thema in D-Dur, die warm und lyrisch ist. Das Klavier setzt mit dem umgearbeiteten Material vom Anfang, ein und diese doppelte Themenverarbeitung hat eine dramatischere Behandlung im Durchführungsteil zur Folge; und stets arbeiten Klavier und Orchester zusammen und führen hin zu einer freudevollen Reprise, wobei die brillante Satzweise für die Hörner stark an Glockengeläute erinnert. Hier wird die Stärke der Anfangsidee geltend gemacht und die Feierstimmung endgültig bekräftigt. Das Adagio in fis-moll beginnt mit einem Dialog voller einfachem aber ausdrucksvollem Gefühl, doch die latente Intensität wird durch ein Echo des Anfangs des ersten Satzes wachgerufen, und Solo-Oboe und Streicher erforschen die Einsamkeit ebensowie das Gefühl des Teilens, die beide so oft im innersten Wesen unserer tiefsten Intimitäten sitzen. Nichts in diesem wunderschön orchestrierten Satz, der reifer ist als es das Alter des Komponisten vermuten lassen würde, ist über-oder untertrieben. Der letzte Satz Alla marcia beginnt leichtfüßig, geht jedoch bald zu den langen Schritten eines jungen Mannes über, und ein herrliches Fugato (eines der wenigen überhaupt, die spontan klingen) ist perfekt in das halb marschierende, halb tanzende und völlig unwiderstehliche Fortschreiten von Toveys musikalischen Truppen eingegliedert. Und stets machen Klavier und Orchester gemeinsame Sache. Diese absolute Zweckeinheit ist eine der größten Stärken des Werks. Bravourstückchen hat es keine, doch es äußert auf wunderbare Weise eine innere selbstbewußte Vitalität, in der der Einzelne und die Gesellschaft so wohl miteinander fühlen wie sicherlich dieses vernachlässigte Werk und seine Zuhörer. Was das „Schottische“ angeht, ist mir kein besonderer Grund bekannt, warum sie es nicht öfter aufführen—außer daß britische Stücke allgemein nie in der Gunst stehen. Das Scottish Concerto ist so schottisch wie es nur sein kann: Es basiert auf drei alten und bekannten schottischen Volksweisen; es verkörpert und erläutert ihren Charakter sowohl emotional als auch technisch und bezieht seine dramatische Durchführung aus den zu den Melodien gehörigen Texten; es wird als schottisch betitelt, wurde von einem Schotten komponiert und wird auf dieser CD von einem schottischen Solisten und einem schottischen Orchester gespielt. Vom romantischen Bild Schottlands mit verregneten engen Tälern und öden Moorgebieten ist es allerdings weit entfernt, denn das Werk verfügt über viel Geist, Gefühl und Elan. Doch ganz gleich, wie offen und freigiebig es erscheinen mag—es birgt dennoch seine eigenen glücklichen Geheimnisse. Das Klavierkonzert im neunzehnten Jahrhundert wurde zu einer romantischen Form reinsten Wassers—mit heroischer Schöpferkraft und Virtuosität der Behauptung der Einzelperson inmitten des großen Gedränges des Orchesters, und dies zu einer Zeit, als Liberalismus und Nationalismus die alten Regimes in Europa stürzten. Doch von Hurrapatriotismus ist im Scottish Concerto keine Spur zu finden, und die Augenblicke der Selbstverherrlichung sind oft ironisch gemeint. Abgesehen von allem anderen herrschen keine aggressiven oder kämpferischen Gefühle zwischen Solist und Orchester; wie Tovey, doch auf ganz andere Art und Weise, ist dies eines der offensichtlich kooperativen Klavierkonzerte, und (wenn man die Thematik einmal verstanden hat) kann man leicht erkennen, daß dieses Werk eine Verherrlichung des Männlichen und Weiblichen und ihres Zusammenkommens ist—und gleichzeitig wird bewerkstelligt, daß es rhetorisch und lebhaft ist, und eine pastorale Idylle mit dem Potential einer großen Liebe schafft. Du hast Zeit deines glücklich langen Lebens konsequent stets das Beste unterstützt. Nie bist du vor Baal auf die Knie gefallen. Ein Schotte bist du, und schlau und vorsichtig magst du sein, wie es dein Geburtsland sprichwörtlich erwartet. Doch deine Schläue und Vorsicht wurden stets zum Nutzen anderer als Dir selbst eingesetzt, und daher nenne ich sie lieber weise Menschlichkeit. Dies war eine „weise Menschlichkeit“, die dennoch zu Zweideutigkeiten und Selbstbehauptung fähig war. Gewagtere Alternativtexte für beliebte schottische Lieder wurde regelmäßig von den Verlegern des 19. Jahrhunderts erwähnt, die—bei weitem nicht prüde—ihre Leser über das Vorhandensein von schlüpfrigen Texten aufklärten, von denen viele wirklich nicht für ein Publikum veröffentlicht werden konnten, das seinen Kindern die Lieder vielleicht beibringen wollte. Mackenzie wußte dies besser als die meisten, und wie wir sehen werden, hatte er außerdem eine tiefe persönliche Erfahrung mit der Notwendigkeit, sich selbst zu behaupten. Das Konzert beginnt mit einer wunderbaren Würde, die aus The Reel of Tulloch abgeleitet ist, einem der ältesten Reels für Dudelsack. Dieser hier ist jedoch mit den geächteten MacGregors verbunden, von denen einer mit Iseabail Dhubh Thulach durchbrannte (mit ihrer leidenschaftlichen Zustimmung), ein Ereignis, das brutale Vergeltungsmaßnahmen der Familie zur Folge hatte, denen das Paar allerdings entkam. Nachdem es eine Dudelsackmelodie ist, ist ein Dudelsackspieler angedeutet, und Mackenzie nimmt zahlreiche Stilelemente auf, die die Hochlanddudelsäcke der schottischen Musik geschenkt haben. Doch nach dem dramatisch bestimmten Einsatz des Klaviers, stellt sich heraus, daß das Allegretto im Hauptteil ein Stück von unbändigem Übermut ist, das sich mit einem ausgedehnten, gar grandiosen Thema abwechselt und sich leicht mit ihm vereinigen läßt, so daß die Musik fast auf ihrer eigenen Aufgeblasenheit zu tanzen scheint. Ihre männliche Selbstbehauptung ist in der Tat ernst zu nehmen—jedoch nie zu lange! In ihr spiegeln sich die komplizierten Resonanzen einer Geschichte, in der wahre Liebe über die Eifersucht ihre Feinde spottet, brillant wider. Obgleich es sich bei den Dudelsäcken in The Reel of Tulloch um Hochlanddudelsäcke handelt und das Instrument des Hirten einen weniger scharfen Klang hat, sind die beiden miteinander verwandt, und nicht nur in Burns’ The Merry Muses war die Spielpfeife eine sexuelle Metapher. Doch ebenso wie Ramsay die Metapher gemildert hat, hat auch Mackenzie die Melodie sanfter gestaltet. Nichtsdestotrotz ist es sicherlich kein Zufall, daß die Melodie den Celli gegeben wird, denn das Cello besitzt eine weibliche Form. Leidenschaftlich und dennoch zutiefst wehmütig, wird die modale Einfachheit der Melodie in der komplexen Tonart cis-moll behauptet, und die Unschuld des Gefühls wird in einen Ausdruck der Liebe ausgeweitet, in dem Würde und Hochherzigkeit nun das unbestrittene Vorrecht aller Liebenden sind. Mackenzie wechselt dies mit zärtlichen Dialogen zwischen Klavier, Holzbläsern und Hörnern ab, bis der unklare Trommelschlag des Sommers die Rückkehr der Celli ankündigt. Der Satz endet mit der Oboe, die an Hirtenpfeifen erinnert, und dem Klavier, das die zweideutige Modalität der Melodie zugunsten eines glückseligen, zufriedenen D-Dur entscheidet. Das Finale ist eine wunderbar witzige und wissende Interpretation von Green Grow the Rashes O, von dem selbst die harmloseste Version eines der am glücklichsten formulierten anzüglichen Liebeslieder ist: wie Burns es ausdrückte: „The sweetest hours that e’re I spent were spent amang the lassies O!“ („Die schönsten Stunden, die ich je verbrachte, waren mit den Mädels!“). Diese alte Melodie erscheint erstmals im Straloch Manuscript von 1627–29, wo sie mit Grein Greus ye Rasses—A Daunce überschrieben ist, und diesen Satz kann man sehr wohl als Tanz des Triumphs und der Wonne bezeichnen. Er beginnt mit einer Bezugnahme auf den Reel of Tulloch aus dem ersten Satz, der selbst ein triumphierender Tanz ist; und an gegenseitiger Selbstbehauptung mangelt es nicht, denn nach dem Sieg über ihre eigene Familie rief Iseabail „Gib mir ein Glas deines Bieres, Liebster, und wir wollen den Tulaichean tanzen!“, doch Green Grow the Rashes O ist das dominierende Thema—ein Thema der Vereinigung und nicht des Trotzes. Von allen schottischen Komponisten, die alte schottische Volksweisen verwendet haben, ist Mackenzie der einzige, der dies mit solch anspruchsvollem und dennoch ungezwungenen Mitgefühl und musikalischem Verständnis getan hat. Das Orchester setzt die Szene, und das Klavier eilt, um sich ihm anzuschließen, und albert selbst mit dem Reel und den Rashes in einer Kombination aus pianistischer und orchestraler „Angeberei“ herum—das Klavier mit parallelen Blockakkorden, das Pikkolo frech und fröhlich wie eh und je. wenn es die Mächen nicht gäb’?